Help us protect night skies by adopting a constellation! Your gift will be matched dollar for dollar through August 3. The stars that make Libra used to be viewed as the front claws of the constellation Scorpius, but the Romans saw it as its own separate group of stars and invented Libra, “the scales.” We don’t know exactly why or when Libra was pulled apart from Scorpius, but we know that it was in place by at least the second century A.D. The Romans associated the scales with trade, since measuring equal quantities of items being traded was very important to their culture. They also associated it with the Roman goddess of justice. We often see artwork related to the practice of law depicting a woman blindfolded and holding a set of scales. The concept of “blind justice” goes back to the Roman times when Libra was invented. For IDA, Libra reflects nature’s fundamental balance between day and night, light and dark. The symbol of scales representing balance is a reflection of what we are working to achieve: a balance between light and dark with the right amounts of each, at the right time of day. We’re helping people around the world put light the right places at the right time to keep everything in balance. The balance of light and dark between the daytime and the nighttime is an ancient biological necessity, and one of the oldest rhythms of life. Artificial light is a relatively new development — something that biological systems had not encountered for most of their history — and it turns out to be very disruptive. Many species of plants and animals are not adapted to the impacts of artificial light once the sun goes down. When a proper light-dark cycle is unbalanced, systems respond in ways that are sometimes harmful to plants and animals. To maintain our health and the well-being of the planet, it’s important that daytime and nighttime cycles are balanced, and that we’re not putting excessive amounts of light into the nighttime environment. When you adopt a constellation through your donation to IDA, you can choose one of four constellations that best speaks to you. 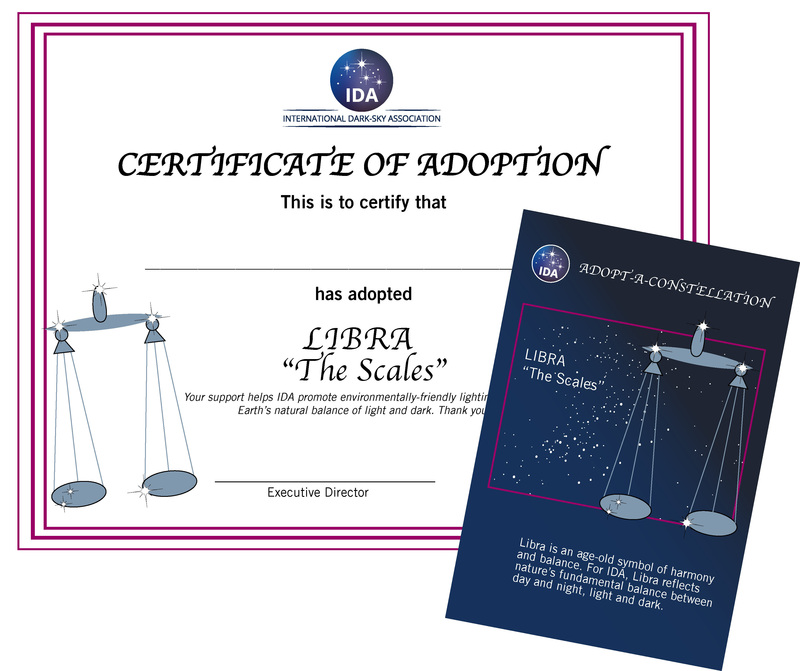 We will mail you a collectible postcard with information about your constellation and a Certificate of Adoption to commemorate your gift. Your gift will be matched by a circle of donors who have pledged to match up to $85,000 in gifts until August 3. Please make a contribution and adopt a constellation right away! Your $5.00 donation can become a $10.00 donation, or your $100 gift can be $200. 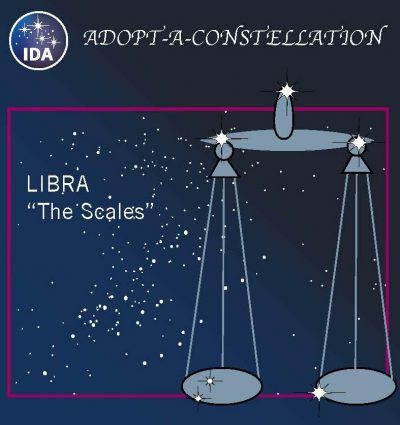 Libra “The Scales” represents nature’s fundamental balance between day and night, light and dark. Noctua “The Owl” represents the preservation of the natural nighttime environment for the health of Earth’s living things. Orion “The Protector” represents the ongoing fight to protect the night from light pollution. Eridanus “The River” represents the forging of relationships between people to support IDA’s work.